Forget OpenStack and Cloud Foundry: Microsoft says its Azure Stack private and hybrid cloud platform is what enterprises are asking for. 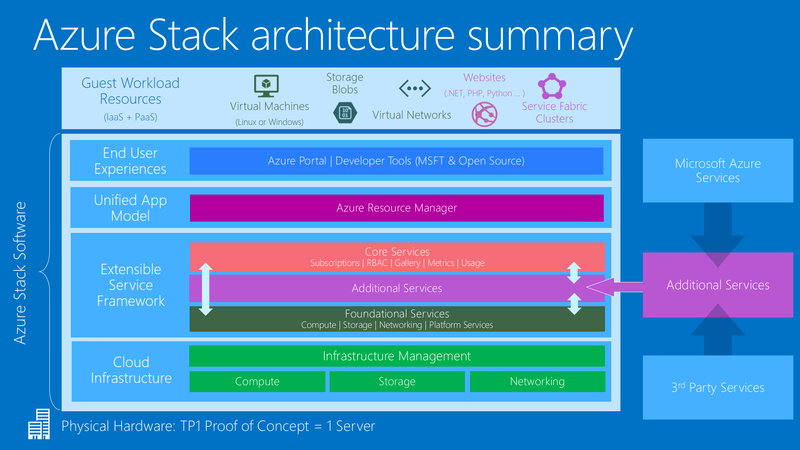 Late last month, Microsoft released the first technical preview of Azure Stack, its private and hybrid cloud platform built on the forthcoming Windows Server 2016. Unlike the existing Windows Azure pack, which gives you a small selection of Azure-compatible features, Azure Stack is (for the most part) the same code as Microsoft’s own Azure cloud, for both running a cloud and delivering cloud services. Other hybrid cloud systems focus only on the application model, which Russinovich views as only addressing developers. “Some people look at Cloud Foundry and they consider that their app flexibility model, but that's just the top edge of the platform.” They’re missing PaaS services, they’re missing role-based access control, network management, creating the virtual machines, managing VMs, the storage behind the VMs, and all the rest of the management that get with Azure Stack. This is not just the top edge [of a cloud model]; it gets very deep. As a cloud platform, Azure Stack represents a different approach to the enterprise data center, and to enterprise apps from Windows Server. And many of the new features in Windows Server 2016 – like nested virtualization, containers and Nano Server – are meant to run both Azure and Azure Stack. It used to be that you focused on building reliable, redundant, fault-tolerant, highly available infrastructure to make sure your application was always up and running. You can treat cloud as a way to get that infrastructure for traditional apps, with IaaS. Azure and Azure Stack have options like availability sets, templates and image galleries that simplify creating pre-configured VMs (including Ubuntu images from Canonical, not just Microsoft workloads) and extensions that inject management agents into VMs, which make virtualization more efficient. But as we’ve learned how expensive it is to buy and manage that infrastructure, the cloud has given rise to an alternative approach: using cheap, commodity hardware managed by automation and building applications in ways that let us ignore infrastructure problems – because the workload can automatically move onto other hardware in the cloud. That means PaaS and microservices; and in the case of Azure and Azure Stack, tools like Azure Service Fabric and Resource Manager for building cloud-style applications, using Azure Blob and table storage. The real value of the cloud comes from the combination of scale, automation and app development that takes advantage of that scale and automation, and that’s what Microsoft is trying to bring to the enterprise with Azure Stack. When Microsoft builds an Azure data center, it deliberately reduces the choice of which servers and storage and network infrastructure it buys, both to get economies of scale by buying a huge amount of the same hardware, and to allow automation. Failing hardware will be automatically removed from service and workloads moved onto identical hardware that’s identically configured through automation; replacing the hardware is simpler and again, it will automatically be configured by the automated management systems. The human pushing the cart of replacement parts will be a lone and occasional visitor to an Azure data center. For Azure Stack, you might want to take a similar approach and order the Azure Stack certified versions of the hyper-converged Cloud Platform Systems that hardware partners like HP and Dell offer, which will come already set up with Azure Stack. Currently they have versions for private cloud based on Windows Azure Pack, but Azure Stack hardware is sure to follow. Dell even lets you pay for a CPS in a flexible way that looks more like buying cloud services than buying hardware. Another approach is to choose hardware certified through Microsoft’s Fast Track program and build a DIY system. “We’re not prescriptive about what processor you use, but we are prescriptive about how you lay out the servers and the software on the servers,” notes Tewari. However, Microsoft doesn’t expect most enterprises to want to do that level of system-building, except for creating a proof of concept – which you can do on as little as a single server (four servers will be the minimum for a production deployment, and that won’t run all the Azure Stack services). But even with a significant amount of the same code in Azure Stack running on standardized hardware, it’s important to remember that running Azure Stack won’t get you all of the features and advantages of public Azure. For one thing, you have to buy all the hardware you’ll need for peak loads, unless you can burst out to Azure for extra scale. And if you can do that with your existing workload, think about why you’re running it on a private or hybrid cloud in the first place, because Microsoft can buy infrastructure and electricity more cheaply than you can, and they already have the skilled admins who know how to run a cloud. Automation based on what Microsoft has learned running Azure will vastly simplify deploying and maintaining Azure Stack, even down to replacement servers being automatically discovered and configured. But you will still have to operate it (especially if you want to add third party services). For another, Azure will always have more services than Azure Stack, and it will get new services first. The Azure regions in the eastern and western U.S. have the same services; but Azure Stack is more like the federal government version of Azure or the forthcoming German Azure region that will be run through a German owner for legal protections or the version of Azure that’s available in China – separate cloud services that get new Azure features on a different schedule than the public Azure service. 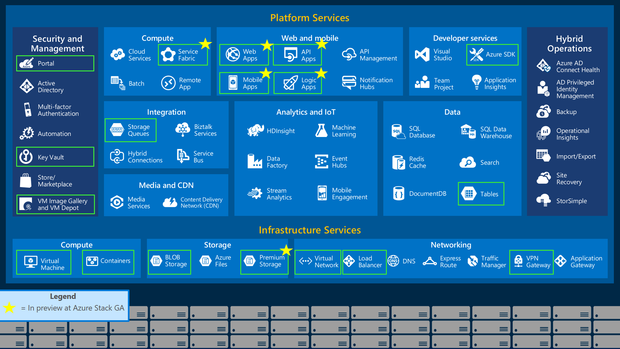 The Azure services that will be in Azure Stack by the time it’s generally available later in 2016. Some services are unlikely to make sense without the global scale of Azure, like the content delivery network that’s part of the Azure Media Services. Others might work best as hybrid services that rely on Azure. The Key Vault service will be in Azure Stack, but it will be a software-based solution rather than using the Hardware Security Modules that the Azure service relies on (complete with explosives to avoid tampering). It’s not a question of Azure Stack being second class, just that it has the services that make sense in the private cloud and the hosted cloud rather than in a hyperscale, global, public cloud, and it’s important to be aware of what you’re getting. He’s confident Azure Stack will be useful, even though it’s not Azure scale. “Even in a four node configuration you can run a significantly powerful system; for a customer using this technology, they're going to be able to have a pretty good experience. And through management tools we will allow them to do capacity planning so they can understand when they’re going to run out of capacity and scale up.” The idea of bursting out to the cloud isn’t new, but it’s going to be a lot easier from Azure Stack, because the environment you have with Azure Stack will be set up in the same way, with applications already configured for the cloud platform. What those customers want is a way of being able to build technology quickly enough to respond to market opportunities. “The ability to get insights is going to be disrupting every business,” claims Russinovich. “Businesses that can't respond are going to be left behind. We’ve got this tension happening in the IT world; businesses are demanding these capabilities and they’re going to the cloud to get them.” If the cloud is a model rather than a location, as Microsoft believes it is, then Azure Stack will give those businesses a choice. If those enterprise customers are right about what they need, Microsoft can turn Windows Server into a private and hybrid cloud platform that’s in sync with its Azure cloud in a way no other cloud provider can match, addressing worries about regulation and data sovereignty, or latency problems working against data on their own servers. “If that’s the blocking issue for a customer adopting Azure, in the broad sense, we expect this to accelerate adoption,” Neil says. And if enterprises are wrong about what they need, Azure is still growing fast, with over 90,000 new subscribers a month.